This friendship may seem like a clash of powers as both these signs hold their ground but it’s also very rewarding. If these two can manage to overcome the moments in which they’re fighting very passionately, they can end up having great fun together. They’re not complete opposites and seem to have the same approach in life. However, while different, this can only be a strong foundation for their friendship. After all, diversity is essential for two people to get along and to do exciting things together. The connection between these two is like wine as it gets better with time and it doesn’t grow old. The Scorpio doesn’t mind taking risks or getting involved in all kind of dangerous activities, and he or she can push the Aries to do even more challenging things, such as quitting a dull job. Many will say being different sets them apart, which is not at all true because a friendship is more interesting when small details in people’s personalities seem to oppose each other. Because they both enjoy fun times and have different ideas on how to spend their time, they can end up participating in all kind of interesting events. It can be said their friendship can mature and become truly valuable for both of them, regardless if they’ve been friends for a few months or a lifetime. Their sense of humor is unmatchable, so they don’t mind joking with each other and when getting together, they can really have good fun laughing at others. Furthermore, the Aries and the Scorpio are very sweet with each other and never allow dishonesty between them. It can be easily said they’re more like family than two people who have decided to spend time together. However, they both need to be less extreme and to tolerate one another’s mistakes. The Aries is very courageous and dynamic, but usually makes friends that can help him or her with something. In return for being helped, Arieses are encouraging, seeing only the best in others and not minding to take some risks for the ones they love the most. Furthermore, these natives are excited to be protective with their friends, but only if they’re with people who can offer a few things in return, such as knowledge and good advice. They want to be considered best friends because they couldn’t deal with being second. Very bossy and usually not seeing the fact that they’re too impulsive and harsh, they can also be too self-centered and even jealous when one of their friends spends more time with others than with them. When it comes to Scorpios, these natives don’t make friends easily, but as soon as they do, expect them to become very loyal. They’re not interested in anything superficial and prefer to keep in touch with intelligent acquaintances who can have a deep connection with them. Scorpios are vengeful creatures who never forget being crossed and who don’t hesitate to end friendships if their security has been in any way threatened. Not liking the company of too many people, Scorpios prefer to participate at small events and to only enjoy a few of their friends, usually the ones they trust the most. The friendship between the bold Aries and the intense Scorpio is very passionate because neither of these two minds taking on challenges and going to the extreme, regardless of the situation. This is the type of connection that may require the police to be called on both of them, especially if the Scorpio doesn’t find solutions to problems like he or she usually does. When not feeling like doing anything, the Scorpio can be helped by the Aries to become active again. If very good friends, these two can make the impossible possible, even if they’re sometimes fighting very passionately. The Aries is ruled by the planet Mars, while the Scorpio by Pluto. Because Mars is also the planet of passion, the Aries and the Scorpio will do many interesting things together and even take risks. Their arguments will be noisy but never serious because they can immediately make up. Pluto has an influence over how dynamic their relationship is as well because it gives the Scorpio more energy. The Aries belongs to the Fire element, the Scorpio to the Water one, which means a combination between them is difficult, yet still very efficient. When using their physical charge and emotions, the Aries and the Scorpio can come up with great ideas. 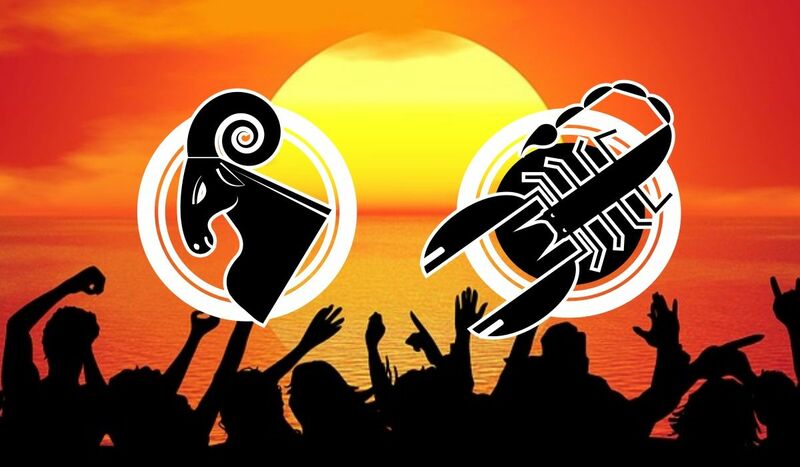 The Scorpio is good at developing strategies and can help the impulsive Aries not throw him or herself into things. In return, the Aries can show the Scorpio how to think more rapidly and how to not give up when first trying something and not succeeding. The Scorpio can teach the Aries to be calm, whereas the latter can show the former how to live more excitingly. Of course, just like in any other friendship, some compromises are required, but if these two are good friends, they’ll understand this and also take some action. The Aries is cardinal, the Scorpio fixed, which means the Scorpio plans for the future, while the Aries just takes the initiative. The Scorpio can always help the Aries be more determined to succeed and to stick to plans before moving on. If these two can manage to keep their arguments under control, they can do amazing things together because the Scorpio can control everything about emotions and resources from the shadows, while the Aries can be the one who thinks about what they could do next. It would be best for them to not become lovers because the Scorpio takes romance too seriously and the Aries is not known to ever think of it as something very deep. Even as friends, the Scorpio needs to accept the fact that the Aries doesn’t analyze before doing something. Furthermore, the Aries should be less selfish and appreciate their friend’s great ideas. It’s possible for them to meet at the party of a common friend, a nightclub or perhaps in the park. After becoming friends, they’ll go to many concerts and participate at many sports events. Because they’re very similar, they’ll both work hard to be in power, which means they have another reason to fight. However, they need to get along very well if they want to get far in life and to gain advantages from their friendship. The Aries is better at taking the initiative and thinking of things that could work for both of them. In return, the Scorpio can focus on their plans and the way these progress. While both are very loyal to their connection, the Scorpio sees devotion in a deeper way. Neither of them accepts to be deceived, so the fact that they’re both jealous makes their connection more passionate and fiercer. While the Scorpio can tolerate many things, he or she is as well more possessive. It doesn’t matter how many differences these two have, they’ll both take great risks, especially when their common goals need to be fulfilled. Always being engaged in new adventures, they’ll never get bored with each other, but they can have a difficult time understanding one another’s needs. The Aries is extroverted and doesn’t mind being open about what he or she feels, the Scorpio is introverted and prefers to keep secrets. However, when combining energies, these two can complement each other and arrive to great results. They’re both interested in winning only the big prizes in life and neither of them wants the second place.